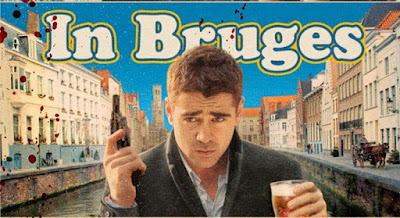 Colin Farell really wants to be "anywhere but f*cking Bruges"...I on the other hand have to disagree. I really liked this city. Well, I am not a hitman and I did not go there after a "job". I was not dragged across this small Belgian medieval town. I certainly did not meet a hot blonde girld who is a part time drug dealer part time small time crook. I did not go to Bruges with my partner on the "job" and I did not insult all the Americans I met. I did not do all these things,I simply watched "In Bruges" a very good 2008 movie starring Colin Farell taking place, where else,"in Bruge". Its a whole different crime movie. If you are used to ex Mr Madonna stuff you might find this refreshing. Not that I did not like RocknRolla, but all this "I am cooler than you attitude" has its limits. The characters in "In Brigus" are plausible and even though they are hitmen they feel like your pub mates. You actually care about them. The first part of the film is a little bit slow but that will not bother you at all. Even though the film is not what you would call a comedy I found myself laughing or smiling for a very good part of the film. It has a great sense of humor that is totally politically incorrect and I really enjoyed it. The second part is faster moving and leads to an unexpected finalle that leaves you where all fims should leave you and does not drag for 5 more minutes to ruin it all. A very good film that I would recomend to anybody. Its a rather improbable film. You know...one of those rare choices that you know very little about and turns out to be a very memorable experience.